As noted by the creators of new products and the company, after the March news – hours of Tornado, which is almost vzbalamutili Basel exhibition in 2012, they started thinking about creating hours, which could reflect the simple joys of life on earth. The result was new and original women’s watches Butterfly. In technical terms, the clock is not represent no great surprises. The model is based on a quartz mechanism. 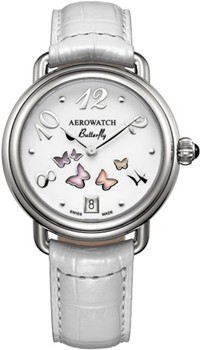 The main decoration is a new flock of careless butterflies on the dial, which changes color every hour. However, the company even in the official press release did not specify the technical details that allow you to achieve a specific effect. Well, let’s not, and we violate this feminine idyll analysis of the technical details. Novelty is presented in a circular casing diameter of 35 mm of steel. The dial is covered with white rhodium, temporary indexes – Arabic. Arrows – leaf-shaped. The glass covering the dial – Sapphire. The aperture of the date located on the position of “6” hours. Waterproof model is 50 meters. Buy a complete set, you can watch with steel bracelet or white strap.